János Áder (Hungarian pronunciation: [ˈjaːnoʃ ˈaːdɛr]; born 9 May 1959) is a Hungarian lawyer who has been the President of Hungary since 10 May 2012. Previously he served as Speaker of the National Assembly of Hungary from 1998 to 2002 and deputy chairman of the European Parliament Committee on the Environment, Public Health and Food Safety from January to May 2012. Áder grew up in the small town of Csorna in Győr-Moson-Sopron County. Beginning in 1978, he studied law for five years at the Faculty of Law and Political Sciences at Eötvös Loránd University in Budapest. From 1986 to 1990, he was a research fellow at the Hungarian Academy of Sciences' Sociological Research Institute. Áder, who has a law degree, was an early member of Fidesz (Alliance of Young Democrats), at the time a liberal coalition of democrats (although it has shifted to center-right as of 2012). He served as a party legal expert. 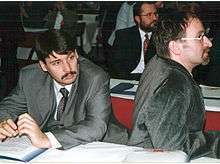 Áder was a member of the Opposition Round Table which, in 1989, negotiated an end to single-party rule in Hungary. In the 1990 and 1994 elections he was head of the Fidesz campaign. He was a member of the Hungarian Parliament (Országgyűlés) from 1990 to 2009, and was the Speaker of the National Assembly of Hungary from 18 June 1998 to 15 May 2002. He was the leader of the Fidesz caucus opposition from 2002 to 2006. In 2011, he helped draft legislation which changed the role of the Hungarian judiciary, leading the European Commission to bring the matter of Hungarian judicial independence before the European Court of Justice. He also helped draft the legislation which revised Hungarian electoral laws. He served as Deputy Speaker from 9 September 1997 to 17 June 1998 and 18 June 1998 to 15 May 2002. In the 2009 European Parliament election, he became a member of the European Parliament. He was elected a deputy chairman of the Committee on the Environment, Public Health and Food Safety on 23 January 2012. On 16 April 2012, Áder was selected by the majority of the parliament, and became the new President of Hungary after the resignation of Pál Schmitt. He was elected on 2 May to a five-year term by a vote of 262–40, and assumed office on 10 May 2012. He is consequently the first president to hold that office since the new Hungarian constitution took effect on 1 January 2012. János Áder met Shimon Peres at a working dinner in Jerusalem on 15 July 2012, and invited the Israeli President for an official visit to Hungary. Áder told that their conversation had focused on deepening scientific cooperation between the two countries, in which Hungary could benefit from Israel’s experience in areas such as farming and water management. On 16 July, he told a commemoration of Raoul Wallenberg in the Knesset, that The Holocaust is "the tragedy of mankind without parallel". He said the rise of anti-Semitism in several countries in Europe had been discussed, he said, "adding that steps against such phenomena must be taken together". Later, The Simon Wiesenthal Centre asked Áder in an open letter sent to MTI to help bring alleged Nazi war criminal László Csizsik-Csatáry to justice “as quickly as possible”. Áder said Hungary’s new constitution guarantees constitutional rights and catered for fourth generation human rights in his address of the 67th session of the UN General Assembly in New York City on 25 September 2012. These include Article P, which states that “natural resources, especially the farmland, forests and the drinking water supplies, the biodiversity – in particular native plant and animal species – and the cultural assets shall form part of the nation’s common heritage; the State and every person shall be obliged to protect, sustain and preserve them for future generations”. He mentioned especially the water supply, and how short-sighted and irrational it was the way “we pollute our waters”. Áder also told Hungary has taken active part in the work of the UN’s Friends of Water working group. Hungary will host a conference on water and sanitation in Budapest in 2013. He sent the election procedures bill to the Constitutional Court for preliminary legal review on 6 December 2012. He stressed in a statement that the bill passed by Parliament on November 26 guarantees free and democratic elections. On 3 January 2013, the Court ruled that the law curtailed voting rights to an unjustifiable degree, due to the fact that the requirement for voters to register prior to going to the polls applies to every voter. As a result, Antal Rogán announced the government will not introduce voter pre-registration in the 2014 parliamentary election. On 13 March 2013, Áder said he would sign the controversial fourth amendment to Hungary's constitution. He stated that he had made his decision in view of his promise that as President of Hungary he would carry out the responsibilities conferred on him by the constitution without fail. "It is my unequivocal constitutional duty to sign and declare this constitutional amendment as law. This is regardless of whose tastes the changes meet and regardless of whether I like it or not", he said. Áder read letters, messages and the "clever and sometimes indignant and politically-charged arguments of experts". “I was guided by the single goal which is in harmony with my presidential oath: to represent the constitutional order and the unity of the nation”, he said. Accordingly, Áder signed the constitutional amendment on 25 March 2013. In June 2013, Áder apologised in the national parliament of Serbia for Hungarians' war crimes against civilian Serbs in Vojvodina in the Second World War. Some days earlier the Serbian lawmakers adopted a declaration, which condemned the massacre in Vojvodina in 1944-45 and resolutions made under the principle of collective guilt during the war. Áder said "although nobody can undo those crimes, we still believe that forgiveness following a mutual apology can point beyond reconciliation. Because we, Hungarians of today, and Serbs of today, stand united as one on the side of the innocent victims. The legacy we want to pass on to our children is that of life, justice and cooperation, and not that of death, untruth and hatred". János Áder is married to Anita Herczegh, who works as a judge. They have three daughters and a son. Áder's father-in-law, Géza Herczegh, was a judge of the International Court of Justice at The Hague from 1993 to 2003. 1 2 Verseck, Keno. "Close Orban Ally is Hungary's New President." MSN News. 2 May 2012. Accessed 2012-05-05. 1 2 "János ÁDER." Members of the European Parliament. European Parliament. No date. Accessed 2012-05-05. ↑ "Alapító atya-e Áder János?" Magyar Narancs. 17 April 2012. Accessed 2013-02-15. 1 2 3 "Hungary: Janos Ader Replaces Pal Schmitt as President." BBC.co.uk. 2 May 2012. Accessed 2012-05-04. 1 2 3 4 Hodgson, Robert. "Áder a Shoe-In for President." Budapest Times. 20 April 2012. Accessed 2012-05-04. 1 2 3 4 5 6 Kuli, Alex. "Hungary Elects Orban Ally as New President." Associated Press. 2 May 2012. ↑ "Csornától a Sándor-palotáig – Áder János életrajza". Erdély Ma. Retrieved 21 July 2012. ↑ "President invites Israeli counterpart to Hungary following Jerusalem visit". Politics.hu. Retrieved 21 July 2012. ↑ "Holocaust mankind's "unparalleled tragedy", says Áder during three-day official visit in Israel". Politics.hu. Retrieved 21 July 2012. ↑ "Wiesenthal Center asks Hungarian President's help in bringing alleged WWII criminal to justice". Politics.hu. Retrieved 21 July 2012. ↑ "Hungary focuses on "fourth-generation" rights, says President in UN address". Politics.hu. Retrieved 29 September 2012. ↑ "Áder remands electoral bill to Constitutional Court, but says controversial law guarantees free elections". Politics.hu. Retrieved 4 January 2013. ↑ "Government not to introduce voter registration in 2014 following constitutional court decision, top Fidesz official says". Politics.hu. Retrieved 4 January 2013. ↑ "Áder pledges to sign constitutional amendments, citing need for national unity". Politics.hu. Retrieved 28 March 2013. ↑ "Áder János aláírta az alkotmánymódosítást". Index.hu. Retrieved 28 March 2013. ↑ "Hungarian president in Belgrade visit apologizes for crimes against innocent Serbs in World War II". Politics.hu. Retrieved 2 September 2013. ↑ "Hungarian PM Nominates Janos Ader as President." China Daily. 17 April 2012. Accessed 2012-05-05. Wikimedia Commons has media related to János Áder.